This picture is from the 50s and may include Ron Ayers. The following letter isn’t quite right because there is a newspaper article from Jan. 11, 1921 announcing a meeting of Troop 6. Apparently two troops - 4 & 6 were established at Trinity because there was a ceiling of about 45 scouts in a troop. I was happy to receive your letter of January 17th, and am sorry that an excessive number of activities have prevented my answering sooner. I am much interested in your report on Scout Troop 6. I have often thought of my early days in Idaho Falls and my association with the fine friends I made, but particularly my association with the boys of Troop 6. We had a wonderful time and many of the things we did would really make interesting reading. I am very surprised that the record of the Charter for Troop 6 was recorded in November of 1922. This is definitely not correct. Troop 6 was organized in the early spring of 1921. On June 9, 1920, I was married to Wrenn Willson, daughter of Dr. T. C. Willson and sister of Dr. Harry L. Willson and sister-in-law of Mrs. Harry L. Willson who still resides in Idaho Falls. Soon after we returned from out honeymoon at Jenny Lake, Dr. Rollins started to talk to me about helping to organize a Troop of Boy Scouts with the Methodist Church as sponsors. 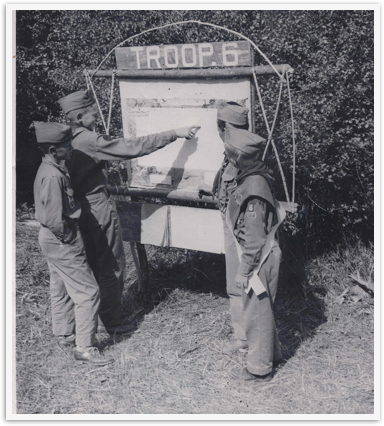 I did not feel I could take on the responsibility at the time, so like so many worthwhile things the development of Troop 6 remained in the discussion stage until the spring of 1921. I remember I became Scoutmaster of the new troop in March of 1921, and held the first meeting of the troop in the basement of the Methodist Church either the last week in March or the first week in April 1921. I am sure of these events because our son was born on May 4, 1921, and the Troop voted him as Mascot at the first meeting after May 4th. Another event fixes the year 1921. In August of 1921 a group of us took all the Idaho Falls Boy Scouts on a two weeks trip through Yellowstone Park. There were 110 boys, which constituted practically all of the boys in Idaho Falls that belonged to the Scout organization. We were able to secure the services of a man and his wife as coo. They had just been married and were willing to go along, do the cooking for their transportation and food for the two weeks. Mr. Clyde Brainard, who operated a trucking company, furnished 3 trucks and drivers. The merchants of the town furnished all the provisions, and each boy paid $15.00 to buy gas, oil and other unforeseeable expenses. As I remember, there were only 5 men besides the cook who went along as supervisors. These were Dr. Rollins, a Dr. West, Dr. Shattock, Clyde Brainard and myself. If you think it was not a real job for 5 men to supervise 110 boys then I recommend that you try it. I lost 10 lbs. On two weeks, but I think the whole trip was a great success for there was no serious unpleasantness and the conduct of eery boy was surely a great tribute to Scout training. We circled the Park and returned hoe to Jackson Lake country, Willson and Swan Valley. I left Idaho Falls March 1, 1922, and went to Seattle where I entered the University of Washington and graduated in 1925 with a Bachelor of Science degree in Forest Management and Forest Products. I have not been actively connected with Boy Scout work since leaving Idaho Falls. I have however given a number of lectures on forestry and woodcraft to a number of boys organizations. I wish I could recall the names of more of the boys who were Charter Members of Troop 6. I do however remember Warren Shattock, George Barcus, Tommy Holden, Bob Rollins, and Max Willson. Naturally, I have wondered what has happened to them and if any of them are still in Idaho Falls I would thoroughly enjoy hearing from them. I am surprised to learn that the Troop numbers 50, as I remember 42 was the quota limit in 1921, and Dr. Rollins used to get rather exasperated with me because I permitted more than 42 to attend the meeting. We had such interesting times at our meeting that it did not seem possible to hold the quota, and I did not have the heart to tell any boy there was no room for him. I congratulate you and all your associates on the fine work you are doing. The fact that you have been able to graduate 50 Eagle Scouts is indicative of the time and effort that has been expended in the development and training of boys and young men for future outstanding citizens. You ask me to give you a resume of what I have been doing. I have followed the profession of forestry since 1925, a few years in private industry and in government service, with short leaves of absence to do special work in the Amazon River Valley, Mexico, Canada and Central America. When I retired 6 years ago I was Director of Forest Products, Division of Foreign and Domestic Commerce, Department of Commerce. For 6 years I have lived on a small estate 17 miles from Washington, raise some flowers and improve my woods which consist of 12 acres of hardwood timber. I do some consulting work in the field of forestry and forest products, bit I don’t let any work interfere with my enjoying life. Two years ago, Mrs. Holman and I spent 3 months in Europe. Last fall we drove 10,000 miles visiting friends and places in 24 different states and Mexico. Next fall we hope to visit Idaho Falls and I hope to see some of my old friends and attend a meeting of Troop 6. I surely wish I could drop in on you and at your banquet on Feb. 8th and believe me I have figured every way possible to arrange it, but I am sorry I just can’t make it. Please accept my congratulations for the fine work you are all doing, and I pray that tis work will continue for another 40 years. I surely thank you for writing me and giving me an opportunity to do a little wandering about in the ground that I helped to plow and seed 40 years ago.